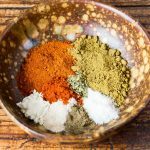 Make your own homemade gluten free taco seasoning! You save a lot compared to store-bought taco seasoning packets and on top of that you get to avoid the fillers and preservatives. There is a good chance that you already have all of the taco mix ingredients needed in your spice cabinet. Measure all spices into a bowl and stir or whisk to combine. Add to 1 pound of browned ground beef together with 1/2 cup of water. If not using right away, store taco seasoning in a spice jar, small Mason jar or any other container with a tight fitting lid. Store in a cool, dry place. One batch will season 1 pound of ground meat. Multiply this ratio as needed for your recipe or for storage.